JP and Courtney Nyadaro pose with their family. 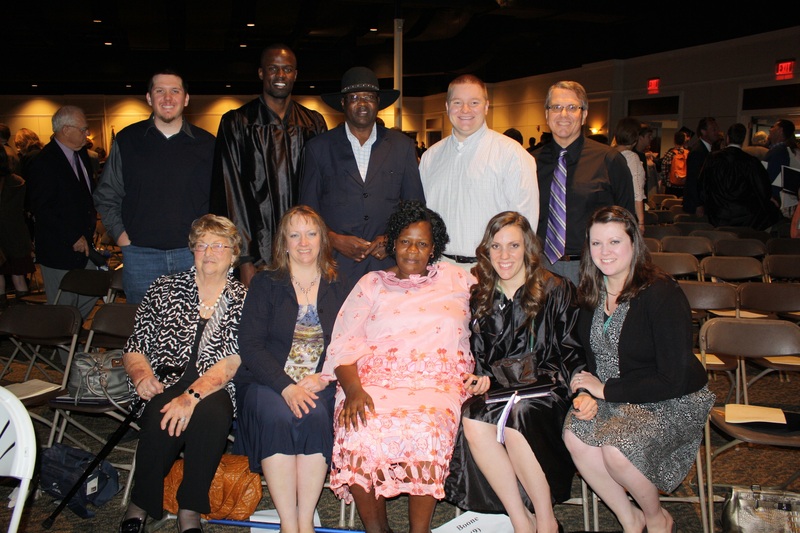 JP’s family was flown from Kenya to watch their son graduate. Last May, while most graduating seniors were checking off ticket lists for who they could and could not invite to graduation, JP Nyadaro was trying to piece enough cash together to get his parents on a plane to Nashville. Nyadaro, a former Trojans basketball player from Kenya, didn’t have enough money. He was out of options. Nyadaro worked for Glen Linthicum at plant operations and Linthicum found out what he was trying to do. Linthicum sent out a text to vendor companies that work at Trevecca, and by the next day he told Nyadaro he had enough money to cover the difference for his family, about $1,500. “It was a really big thing for me because that was the first time my parents got to see me graduate,” said Nyadaro, who now works as a care coordinator at Room in the Inn in Nashville. “In Kenya we don’t have graduations for high schools, so this was the first time they were able to see me graduate from a school. Nyadaro is one of many students that Linthicum and other faculty members at Trevecca have been able to help out in small ways in times when they needed it most. Now, Trevecca is establishing a new committee, the Special Needs Committee, for cases just like these. Now, a committee made up of Linthicum, Cooning, Tom Middendorf, director of the Center for Leadership, Calling and Service and Chuck Seaman, director of financial services, will seek out special situations and oversee the giving process so that donors can be recognized if they so choose and so that they can receive tax credit for their gift, Cooning said. The fund currently has $660 in it according to Seaman. The committee will accept suggestions, but will not allocate the money like a scholarship. It is simply to help those who need it most, Cooning said. Over Christmas break, Linthicum found a couple of vendors to help pay the rent for a student in University Terrace Apartments when they were going to be evicted and help put food on the table for a few students when they had no means of getting food themselves, since the cafeteria and their campus job was on break. A lot of these needs have been specifically filled by vendors who work on campus: the lawn guys, or the cleaning company among others. One of the hopes with this fund is that alumni and members of the community would be interested in donating to help students as they face certain hardships. Current students would even be invited to help donate where they could, Cooning said. Gifts of all sizes will be welcomed. HEY GUYS, AM RAWLINGS ODUK FROM KENYA. AND I WAS KINDLY ASKING FOR AN OPPORTUNITY TO JOIN YOUR SCHOOL ON BASKETBALL SCHOLARSHIP. Visit our university’s athletic website, http://www.tnutrojans.com/ and find more information on our sports programs there. Thanks for showing interest!